Registrants are responsible for hotel / travel arrangements. We have secured a small block of rooms at the discounted group rate of $139.00 plus applicable taxes. The hotel offers complimentary breakfast each morning, complimentary evening receptions, 24 hour business center, fitness center, outdoor pool, and more. Click here for more hotel amenities. To make a reservation please call the hotel directly 410-727-2222 or 1-800-HILTONS make sure to identify yourself as a member of the NSH Summer Symposium. You can also make your reservations online, www.embassysuitesbaltimore.com end enter in group SRP CODE: NSH. All reservations must be guaranteed by a major credit card or first night's room and tax deposit. The housing deadline is Thursday, May 22, 2014. 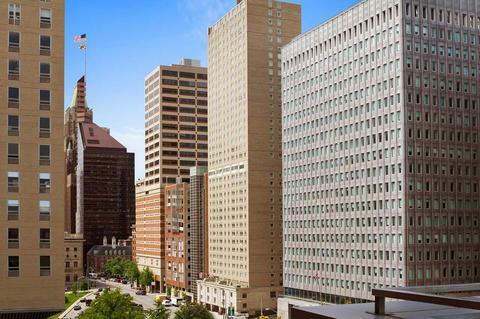 Embassy Suites Baltimore located in beautiful downtown Baltimore and situated amidst the area's finest shopping, theaters, museums and more. The hotel is only 10.5 miles from Baltimore-Washington International Airport (BWI). BWI offers may different types of ground transportation including Amtrak, Light Rail, Courtesy Shuttles & SuperShuttle, car rentals and more. Click here for ground transportation options to get you to and from the hotel. The hotel is in a prime location of Baltimore right near the Inner Harbor, many parking options are available including valet parking at the hotel, or self parking in a city-owned garage. Please note that public garage rates are subject to change without notice. For complete directions and parking options click here. Come early, stay an extra day or just enjoy the evening after workshops in the beautiful Inner Harbor. Colorful and eclectic collections of shops, restaurants, nightlife and entertainment are just steps away from the hotel. Inner Harbor - This is Baltimore's most photographed and visited areas of the city. Locals and visitors enjoy the surrounding neighborhoods that offer a variety of fine dining, cultural experiences and a fun nightlife. Click here for dining and nightlife options. National Aquarium - Maryland's leading tourist attraction, the National Aquarium has a lot to offer with its magnificent exhibits, housing more than 17,000 creatures. Find animals such as stingrays, sharks, sea turtles, bullfrogs, phytoplankton, monkeys, sloths, iguanas and more. Maryland Science Center - As one of the main attractions of the Inner Harbor, the Maryland Science Cetner serves more than half a million visitors per year. Exercise your imagination and challenge your mind through the three floors of demonstrations! Sports Legends Museum - Two amazing museums for a fantastic experience. Enjoy the Babe Ruth Birthplace Museum as well as the Sports Legends Museum. Power Plant Live! - Baltimore's premier dining and entertainment destination only one block away from the Inner Harbor. Water Taxi to both Fells Point and Canton - Located on Lancaster Street, one price buys unlimited rides for a day to explore the beautiful neighborhoods surrounding the Inner Harbor.